This contemporary styled stackable mesh guest chair from Boss Office Products features a screen mesh back for the ultimate in ventilation and support. Other features include padded fabric upholstered seat, integrated molded arms, waterfall seat edge to help reduce leg fatigue, stackable up to four chairs high for space saving storage and a powder coated tubular steel frame with four post tapered legs. 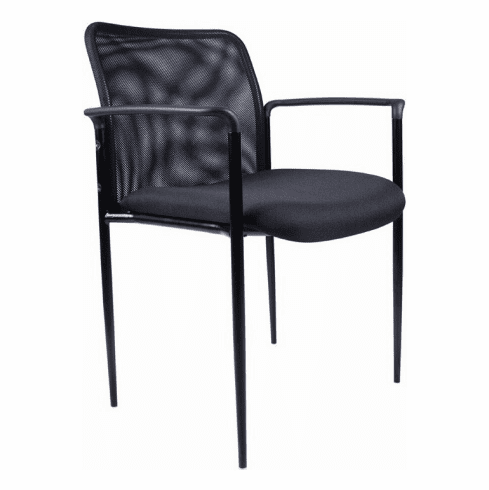 This mesh stacking chair meets or exceeds ANSI/BIFMA standards. Dimensions: Seat Size: 18"W x 18"D. Arm Height: 25.5"H. Seat Height: 19.5"H. Overall: 23"H x 24"W x 24"D. Six year limited warranty from Boss. This chair normally ships within 2-3 business days from either our CA or GA warehouse.